NES Xexyz (USA) in 23:43.62 by £e Nécroyeur. Xexyz is a hybrid scrolling platform/scrolling shooter/tube shooter game created by Atlus and published by Hudson Soft for the Nintendo Entertainment System. 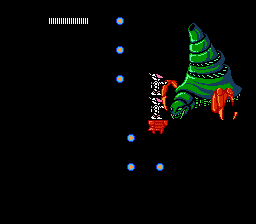 It was originally released in Japan in 1988 under the title Kame no Ongaeshi: Urashima Densetsu (亀の恩返し〜ウラシマ伝説〜), which is loosely based upon the Japanese legend of Urashima Tarō, and features more cutscenes and endings than the North American localization, though gameplay is the same between the two versions. £e Nécroyeur uses various tricks and glitches to defeat Goruza in 23 minutes and 43.62 seconds. WARNING: Due to the game relying heavily on flashing lights that cover the entire screen, viewers prone to epileptic seizures are discouraged from viewing this movie.